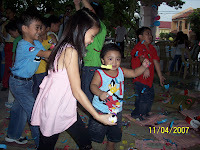 Me, Ailene, and the kids attended the 7th birthday of my cousin’s son. It’s a day for the kids… There were cotton candies, ice cream, fish balls, etc. 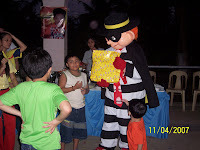 The party was hosted by McDonalds and the kids’ foods were catered by them as well. As for the adults, a separate catering service was commissioned. There were lots of games, balloons, giveaways and toys. My kids enjoyed particularly my youngest, Gio. Immediately after the formal party is a swimming pool party. Inasmuch as we like Gelo and Gio to take a dip at the pool, we have to say “pass” this time as it is already late and my wife and I still have some important matters to attend to. To appease the kids, Ailene and I promised that we will take them swimming some other time. 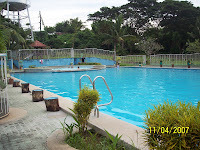 The party was held at the clubhouse of San Isidro Village located at San Isidro, Batangas, Philippines – a decent place for parties and swimming. 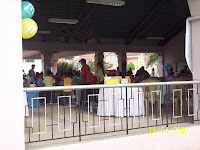 Clubhouse, San Isidro Village, Batangas is a good place to enjoy the party celebration.In this place all type party enjoy like New Year party, Birth Party and all Party. India tour that focus on adventure for sports enthusiasts, span travel locations across Indian margins, but mostly target the Himalayas. If you will go to a long holidays than go to Philippine.Good article.I wanted to write to you, but couldn't find your email, so thought I'd leave a comment. If you go to decided a long Holiday then go to Philippine.There are so many adventure and tourist Places.I like This Blog because all information about Philippine travel. nice.. can somebody know how to get there if your coming from balayan? 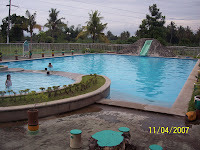 There are a lot of good places to visit in Batangas, and of course in the whole Philippines. 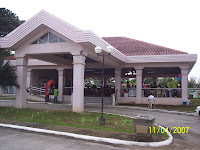 I have a blog that also provide great information on the different tourist spots in the Philippines. Hope your readers will take time to visit it. Thanks a lot.